At least 25 people drowned off the Turkish coast while trying to reach Greece on Sunday, while Macedonian authorities imposed further restrictions on refugees trying to cross the Greek border. IDOMENI, Greece (AP) — At least 25 people drowned off the Turkish coast while trying to reach Greece on Sunday, while Macedonian authorities imposed further restrictions on refugees trying to cross the Greek border. The Turkish coast guard launched a search-and-rescue mission for other migrants believed to be missing from the accident, the state-run Anadolu Agency reported. The coast guard rescued 15 other migrants off the Aegean Sea resort of Didim, it added. The dead included three children, according to private Dogan news agency. Meanwhile, Greek police officials said Macedonian authorities are only allowing those from cities they consider to be affected by war to cross the Idomeni border crossing from Greece. That means people from cities such as Aleppo in Syria, for example, can enter, but those from the Syrian capital of Damascus or the Iraqi capital of Baghdad are being stopped. The two officials spoke on condition of anonymity because they weren't authorized to speak on the record. A U.N. refugee agency official in Macedonia confirmed the new restrictions, and criticized the decision. "This is not all right," said Ljubinka Brasnarska, UNHCR senior external relations assistant in Macedonia, told the AP. "Everybody from Syria who came needs international protection. This decision could be taken only by other competent international bodies, not by border authorities," she said, adding she couldn't explain the latest move. The developments come a day before a summit between the European Union and Turkey to discuss the crisis, which has seen more than 1 million people reach Europe last year. Nearly all refugees and other migrants who enter the EU have been doing so by taking small inflatable dinghies from the Turkish coast to the nearby Greek islands. With thousands of kilometers of coastline, Greece says it cannot staunch the flow unless Turkey stops the boats from leaving its shores. Athens has also criticized Europe for not sticking to agreements to take in refugees in a relocation scheme that never really got off the ground. "While Idomeni is closed for refugees and the flows from the islands, from the Turkish shores to the islands, remain, it must be perfectly clear that the immediate start of a reliable process of relocation of refugees from our country to other countries of the European Union is a matter of complete urgency," Prime Minister Alexis Tsipras said Sunday during a speech to his party. "And this is exactly what we will seek in the summit on Monday. Not just the wording that this is urgent, but that it will begin immediately and with a large number," Tsipras said. While thousands arrive in Greece's main port of Piraeus from the islands, about 13,000-14,000 people remain stranded in Idomeni, with more arriving each day. The refugee camp has overflowed, with thousands pitching tents among the railway tracks and in adjacent fields. The rate at which refugees are being allowed to cross had already been reduced to a trickle, with sometimes only a few dozen, or even nobody, being allowed to cross. Greek police said 240 people crossed between 6 a.m. Saturday and the same time Sunday morning. The camp is beginning to take on a form of semi-permanence, with people realizing they will be spending at the very least several days in the fields. As morning broke, women swept the earth outside their tents with makeshift brooms made of twigs and leaves. Men stomped on branches pulled off trees nearby to use as firewood for small campfires to boil tea and cook. 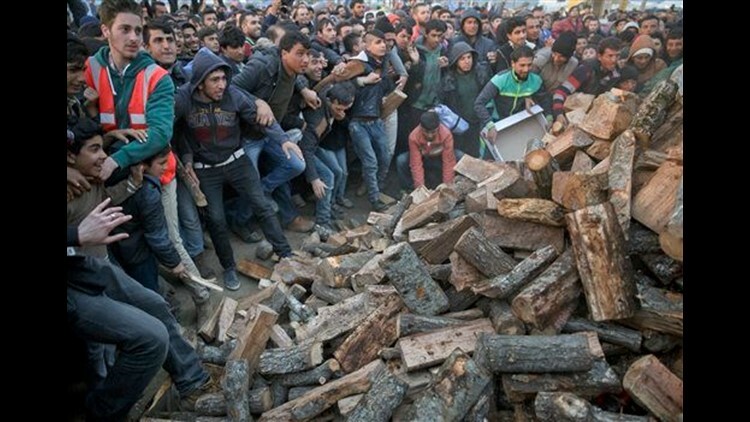 Firewood is one of the main materials in short supply, and a large truck delivery Sunday night was quickly mobbed by hundreds of people in a mad scramble. Men and boys clambered up the sides of the truck, chucking logs to those below, while others climbed over each other to get into the back of the truck, hauling out as much as they could carry. Throughout Sunday morning, dozens of local Greeks arrived in cars packed with clothes and food donations to distribute to the refugees. Many were mobbed as they arrived at the first tents, with men, women and children scrambling to receive whatever handouts they could. The sheer numbers have overwhelmed Greek authorities. Massive queues of hundreds of people form from early in the morning, with people waiting for hours for a lunch-time sandwich. While Greek officials have tried to discourage more people from arriving, and no longer allow buses to drive to the Idomeni border, hundreds continue to arrive each day, walking more than 15 kilometers (10 miles) from a nearby gas station where the United Nations refugee agency has set up large tents. "We have been here five days, or six. Who remembers the days anymore," said Narjes al Shalaby, 27, from Damascus in Syria, travelling with her mother and two daughters, 5-year-old Maria and 10-year-old Bara'a. Her husband and third daughter are already in Germany. "All we do here is sleep, wake up, sleep. We get hungry, we wait in the queue for two hours for a sandwich, we come back, we sleep some more," said Narjes, who worries about her daughters. "She's grown up sooner that she should have," she says of Maria, who is sleeping in the back of the family's small tent. "She's aged." Suzan Fraser in Ankara, Konstantin Testorides in Skopje, Macedonia and Costas Kantouris in Thessaloniki, Greece, contributed to this report.